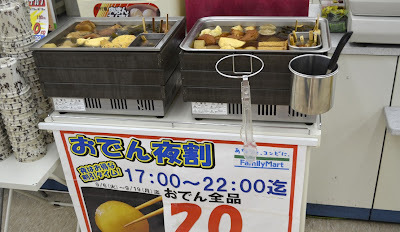 "Okonomi" means "the way you like it" and "Yaki" means "cook" or "grill". 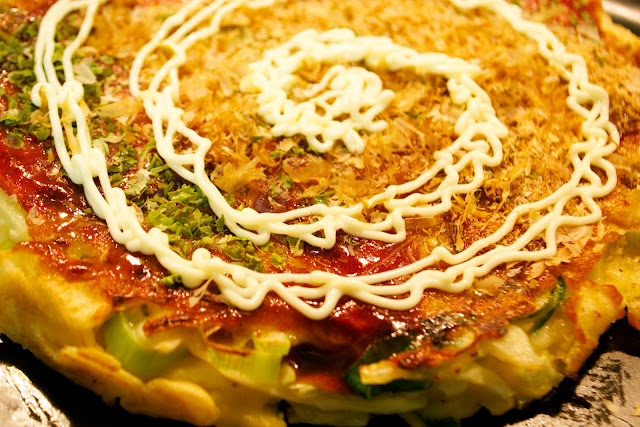 There are many ways to make Okonomiyaki. The main divisions are Hiroshima style and Kansai style. Mine is similar to my mother's style, and she's from Kansai. 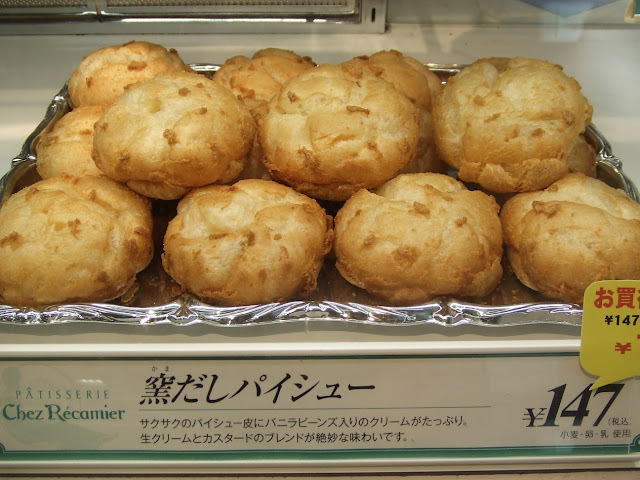 or even mochi and cheese. I use negi (shallots) in my okonomiyaki. and the green part for sprinkling on top. Okonomiyaki is popular with non-Japanese. My Australian workmates love it so I've made it for them a few times. 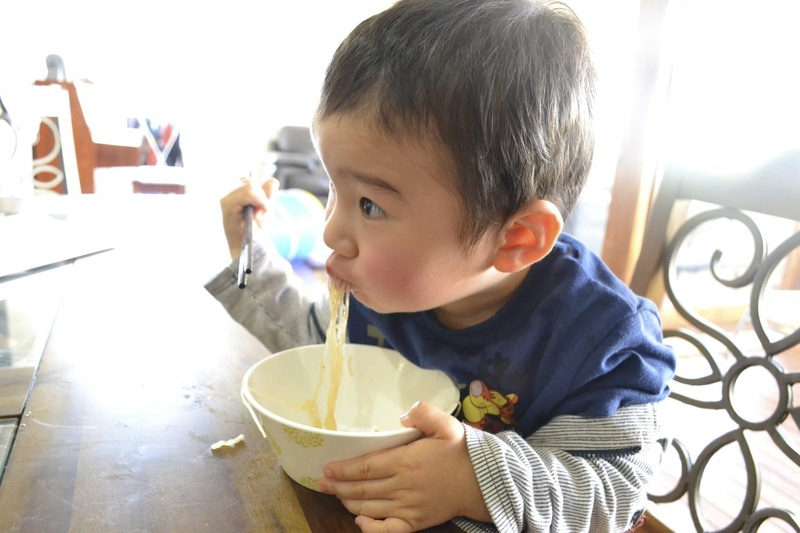 Although the main ingredient is cabbage, even someone who hates cabbage likes okonomiyaki. 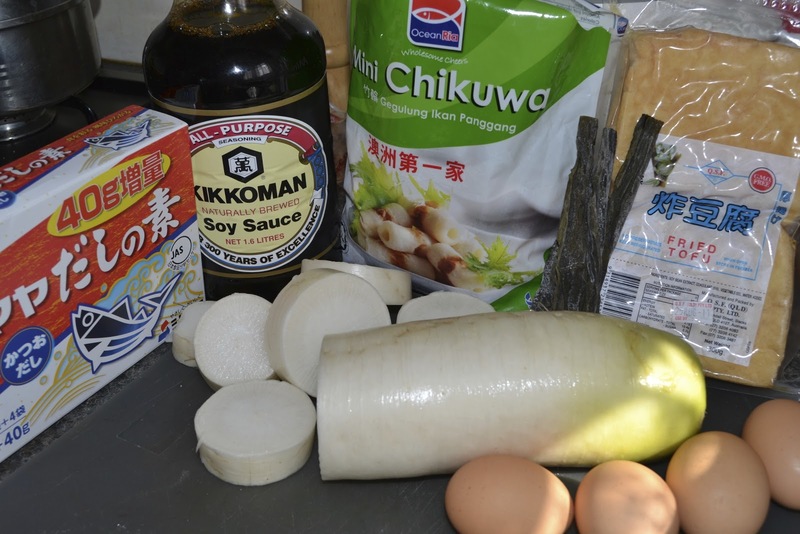 So if you've never tried Japanese cooking, this is a pretty safe one to start with. 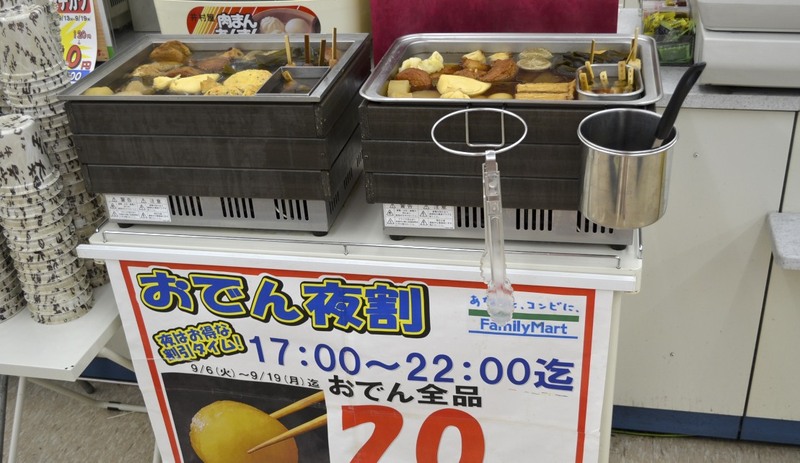 Eventually you will find your favorite version, and that will be your very own "okonomiyaki"! I just checked now... the promo code still works, if you'd like to get a breastfeeding cover or baby sling for shipping only, from Udder Covers or Seven Slings. 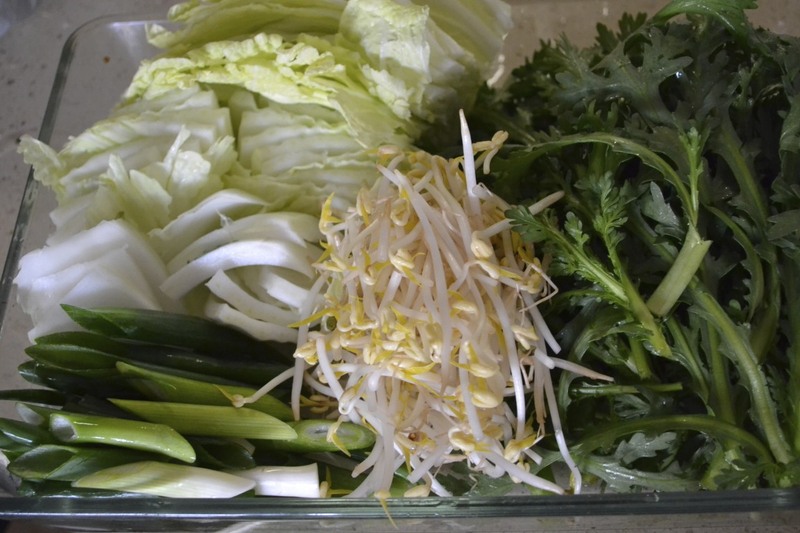 1/2 a Hakusai (Chinese Cabbage) I used about 6 large leaves. a bunch of Shungiku (Spring Chrisanthemum leaves) And/or Spinach. 2. Place cooking equipment on the table. Set out egg bowls and rice bowls and chopsticks for each person. Each person whisks their egg with chopsticks and waits in anticipation. 3. Pour about a Tbsp oil in the heated pan (Med heat). Add half the beef and stir-fry until browned a little. Sprinkle sugar on it, pour on soy sauce and sake. Add water to the pan. 4. 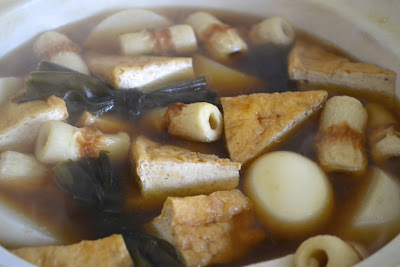 Add vegetables, tofu and ito-konnyaku, each in their own position in the pan. Keep it tidy. 5. Allow to cook for 1-2 min and then dig in! When most of the ingredients are gone, add more of each ingredient, pushing the cooked ingredients to one side (still keeping it tidy). When the sauce becomes low, add some more sugar, soy sauce and water, keeping the taste balanced. (Don't let it boil dry!) Last of all, add the udon noodles. 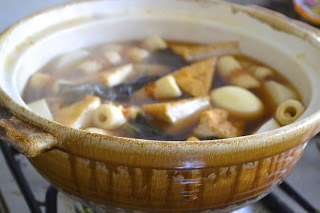 Yesterday we had so much fun having a little Sukiyaki lunch party at my friend's place. 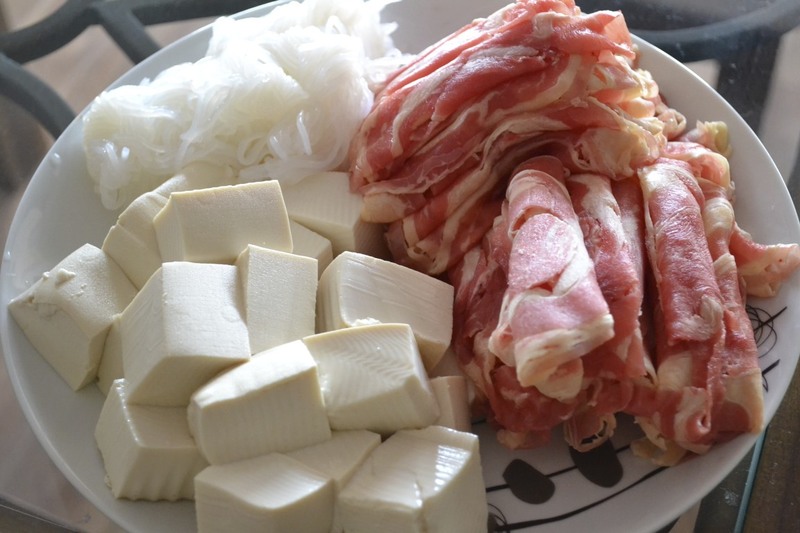 I bet you've heard of Sukiyaki. Most non-Japanese I've asked don't seem to know what real sukiyaki is. 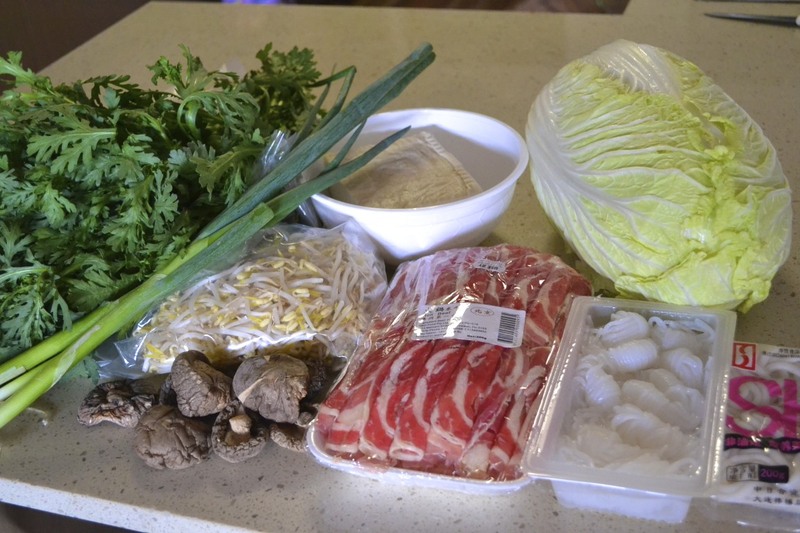 Sukiyaki is my favorite of my mother's cooking. It's very healthy, with lots of green leafy vegetables, mushrooms etc. +/- a dash of sake. 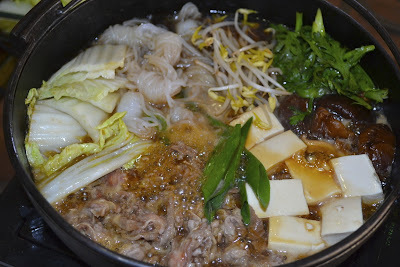 But it's the flavours of the beef, negi, shiitake and shungiku that combine to make the rich and unique sukiyaki flavour. 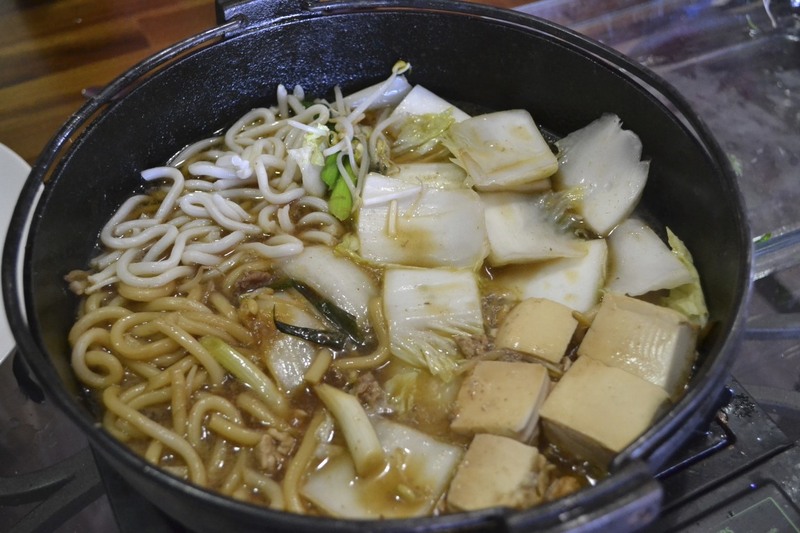 Sukiyaki is cooked on the table in a cast iron sukiyaki pan over a gas flame, or a frypan or skillet. 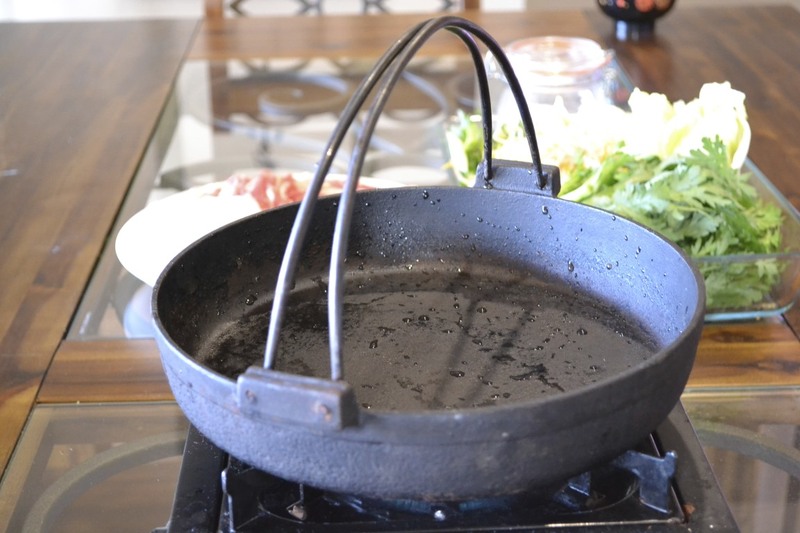 My mother often uses an electric frypan recently.) 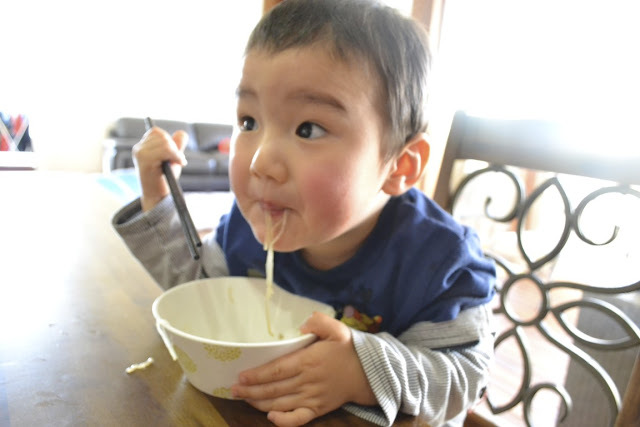 Everyone sits around the table from the start of the cooking and in a minute or two they can start eating, picking something from the pan with their chopsticks, dipping it in their small bowl of raw egg, and eating. Then going back for more. Oh, did I say raw egg? Ah, yes. That's the other essential part of the sukiyaki flavour (however some of my friends think eating it without the egg is fine). 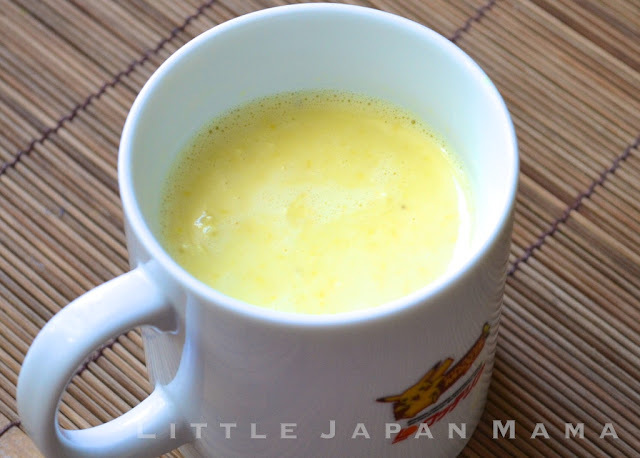 If at first raw egg sounds strange, just think of egg-nog or soft-boiled egg and you realize it's rather normal. The flavour, when combined with the flavours of the sukiyaki, is really amazing. 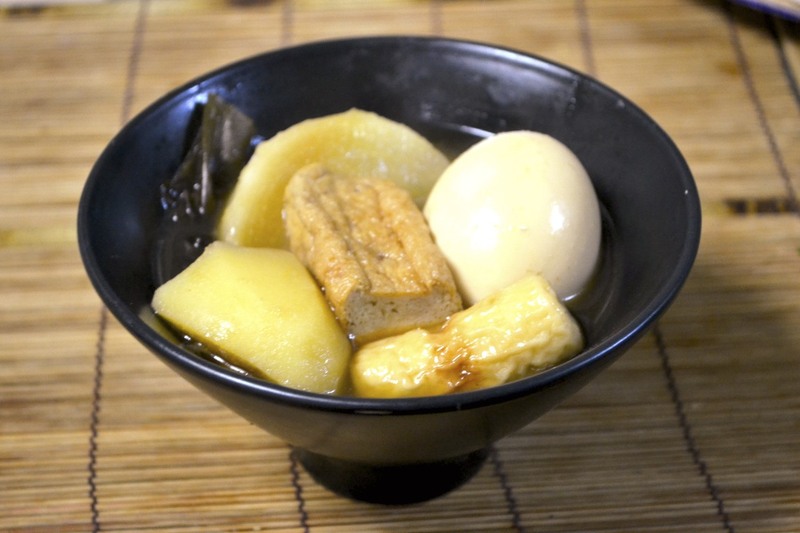 The beef, negi, and tofu are pretty essential, but some of the other ingredients can be omitted if you can't get them. 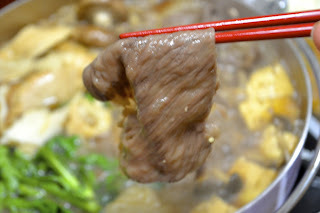 Please watch the videos to get a feel for Sukiyaki. 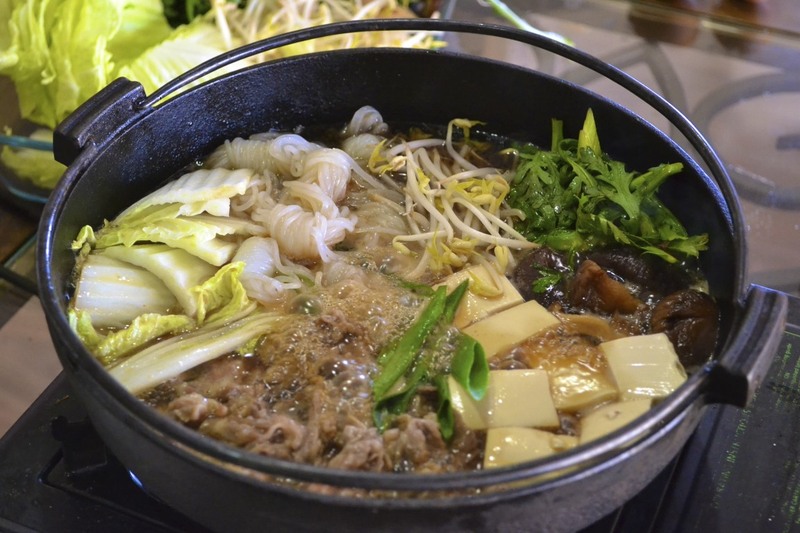 There are several ways to make Sukiyaki, depending on what part of Japan you're from (and how your mama made it). This is Kansai Style. My Mother oils the pan using a chunk of fat cut from the beef (and then throws it away). The promo code still works, so this info is still valid! this might just be very useful. Udder Covers and Seven Slings are giving away Nursing Covers & Baby Slings for $0+shipping. The Promo code is: breastfeeding. Select the design you want, scroll down to the cart, put in the promo code, and the total will automatically reduce to just the delivery charge. You can only get one breastfeeding cover and one sling, it won't work if you order two at once. I just checked it now, promo code: breastfeeding still works. So even if you're viewing this blog late, try it out anyway, you might be lucky. Of course I didn't believe it 100% when I heard that they were giving away free nursing covers and baby slings. I mean, who gives away quality goods for free? But, for around $10 delivery to US, or $15.95 delivery to Australia, I thought it was an acceptable gamble since everything about the companies looked legitimate and you can pay by paypal. Very quick and easy to use. Mine is a size 2. I'm 166cm tall and it's a perfect fit. I wish I'd had these when Baby Boy was a baby! They would have been so useful! In any case, I definitely plan on younger siblings for Baby Boy, so that's what I ordered them for. Bargain. Very happy mama. So why free? I have no idea. Do you know? (***P.S. When I ordered the breastfeeding cover, I had to email them to place my order to Australia because on the original cart it won't add extra postage to Australia. They replied soon and told me the amount and paypal payment instructions. I had paid the original $9.95 shipping at checkout, and then I paid $6 later by paypal. Udder Covers shopping cart says "We ship to the USA and Canada", but they do ship to Australia too, you can select Australia when you put in your address. You just need to email them about shipping because the shipping cost doesn't adjust. Since we're on the topic of non-Japanese things, here's what we had for dinner tonight: Chinese Hot Pot. With lots of Schezuan Pepper, dried chilli etc. Served cooking on the portable gas cooker on the table. You eat it pretty much the same way as Japanese Onabe. Click Here for this Recipe with Metric Cups, Grams and Degrees Celcius. 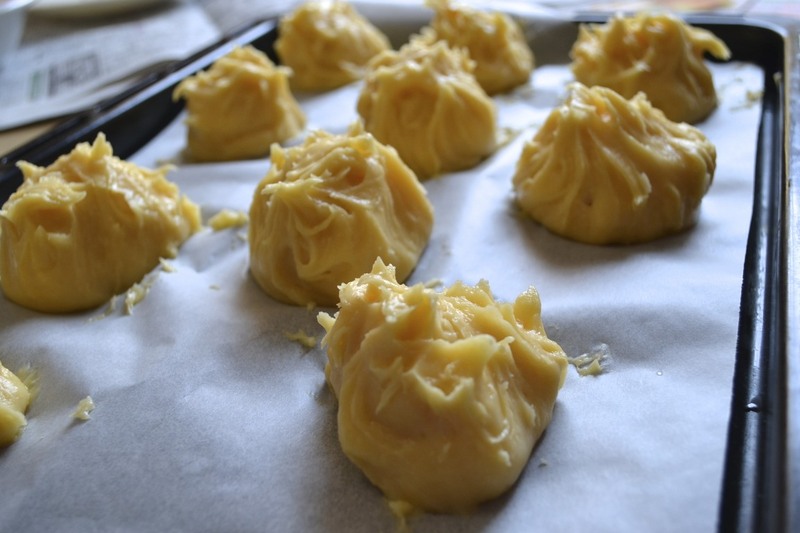 <-Also see this link for more important tips about this recipe. 2. Stir in Sugar, then flour. 3. 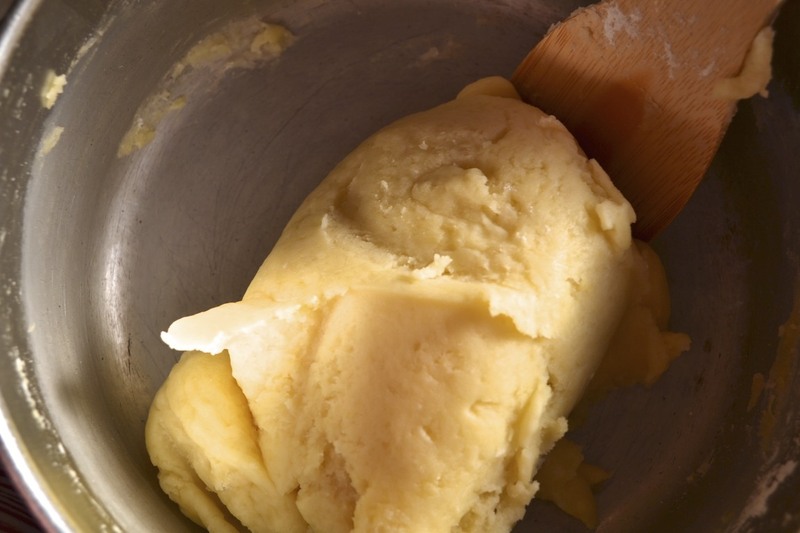 Add eggs one at a time, beating well with a wooden spoon before adding the next egg. 6. Immediately bake in a very hot oven 410-430 degrees F, 25-30min until well puffed and browned then down to 210 degrees F for 40 min or more to dry. When I go to Japan, one thing I must always have is a shu-cream (Japanese Cream Puff). I think they have to be my number 1 favorite sweet. $3 at Beard Papa's in Australia. 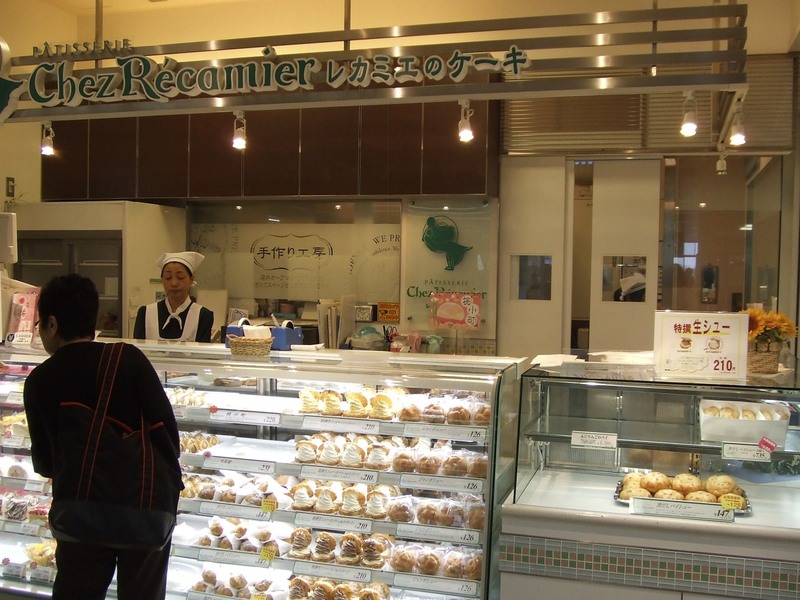 And, the ones in Japan seemed to be tastier. 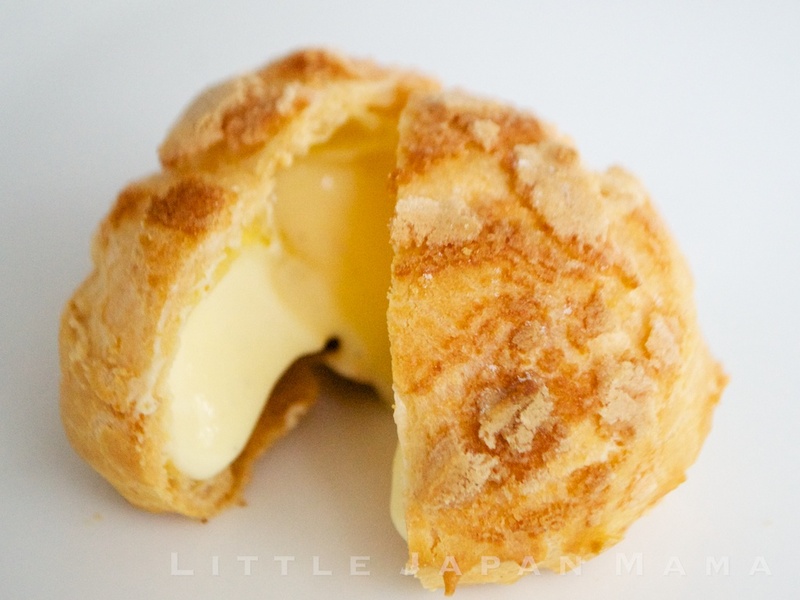 started making cream puffs at home. After a few batches and adjustments I came up with my own recipe. Today I thought I'd make a US recipe. So next time, you can be the one making it for me! YAY!! All cup measurements here are for Australian metric 250mL! I also made a US recipe for American cups and ounces. 1/2 or 1 vanilla bean (I got excellent quality vanilla beans from India on ebay, sooo cheap!) Vanilla extract will do if you can't wait for your bean order. 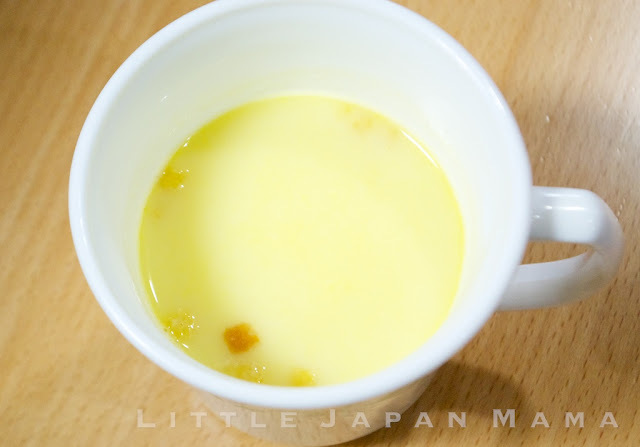 2. add: 2 egg yolks and a small amount of the milk, whisk until combined. Add remaining milk and scrape in vanilla pod. 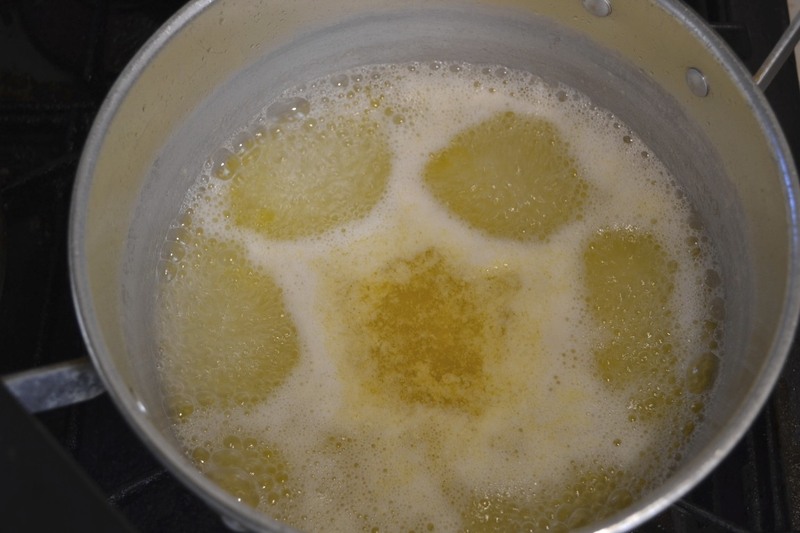 3. stir over medium heat, till it thickens. Remove from heat. 5. allow to cool with plastic wrap on surface to prevent a skin. Refrigerate until cold. The beard papa's I had in Japan was better than in Aus. 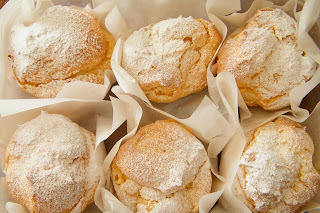 And the "pai-shuu" I had from another patisserie was even better than that. It's the sweet crispiness of their cream puffs which is made by piping 2 layers simultaneously: choix pastry and cookie pastry. I don't have such a machine, but we can make something similar without it.